Luka Bloom surprised his fans last week by announcing the details of a new CD, Innocence, on his website. "Personally, if someone told me in mid-January that by mid-December I'd have a new CD finished, I simply would not have believed it," he writes. "Between tendonitis, and then the throat, I thought this was going to be a tricky year. But as Woody Allen said, 'The heart is a resilient little muscle'." His new CD will be available on the site in mid to late January. "But in truth, this was a quiet year; at home a lot, writing, singing and then recording new songs in my home in the bog. Me hopes ye all like Innocence. I've a good feeling in me waters about it," he said. Bloom will be on tour with the reunited Planxty (you know that band his brother, Christy Moore, fronts) this month, followed by an Irish solo tour in February and a jaunt to Australia in the spring. I have a call into Luka, so keep your eyes on these pages for interviews, CD news and tour updates. Newbridge born singer Luka Bloom will be releasing his first studio album for almost three years when 'Innocence' hits the shops later this month. Luka, who currently lives in Blacktrench, just outside Naas, is still celebrating the success of his album of lullabies, 'Before Sleep Comes', which was given a limited release in 2004. "I had a bout of tendonitis towards the end of last year, which meant that I could not play a regular guitar, so I recorded a few lullabies on a Spanish guitar, intending only to release it on the web, never looking for it to go into shops, so I am delighted with the reaction." Luka's forthcoming album, Innocence, was recorded at home in Blacktrench. "I built the house out here about three years ago, and decided to build a recording studio with it, I wrote all of the songs on the album in the music room here in the house, and then brought a sound engineer out." "Each of the songs on the record tells it's own little story, each song is one I am very proud of. This album is the first time I have recorded 'City of Chicago', which I wrote many years ago. My brother Christy released a great version of it, he is so associated with the song that I have never recorded it, so I thought, Why not do it now?" Since his last studio album, 'Between the Mountain and the Moon' was released almost three years ago, Luka has also released his first ever live album, 'Amsterdam', "a record that I am very proud of, a live album was a new experience and life is all about trying new things." His new record, 'Innocence', the thirteenth album of his career, released on his own label, is available on the internet from the 1st of February and will be in the shops from the 18th of the month. Luka has had a busy start to the new year, playing support at the sold-out Planxty gigs, in Dublin, London and Belfast. "I am a fan of Planxty the same as anyone else, and loved hearing them play, to be able to play with them myself was magical." Luka is not long back from a tour of Belgium, is shortly to play a series of promotional gigs around Ireland, and in March will depart on a lengthy tour of Australia. "There's always been a bit of the auld rambler in me, it's a great life I have really, and I hope to continue doing it for ever." In 1990, as 'Riverside' was coming out on Warners in the US, I did a gas tour of Manhattan, called The Irishman in Chinatown tour: Eight gigs in seven days - in rock clubs, punk clubs, jazz clubs, a gallery and an Irish pub. It was so good that we decided to repeat the exercise in Los Angeles, to launch 'Riverside' and, I suppose, myself in the US. Having done the various mad venues in LA, the highlight was to be the last gig in this Irish place in Santa Monica (I think), called Molly Malone's. There is a very strict rule in California about venue capacity. A venue which in Ireland would pack in 300 people, would be deemed in California to be suited for about 200 people. There was a great buzz in the venue and it was indeed, stuffed! 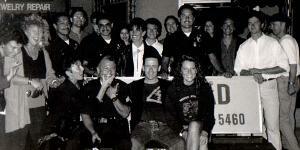 About 10 minutes before going onstage I was informed that the fire and police people were outside, and the gig was off. Someone had squealed. Having come so far to do this gig, I sought some little satisfaction from the mess. So I borrowed a friend's acoustic guitar and went to the corner beside the club. I stood at the corner and started to sing. The crowd, who had just been evicted prematurely from the club, gathered around, and were thrilled at this spontaneous outburst of song on the street. The cops weren't so impressed! A young cop rushed up to me, and demanded I stop immediately. I stopped, but lost it! "Where's the boss here?" I asked him. "In the first of the two squad cars," he said. Up I went, guitar in hand, and tapped on the cop's window. He rolled down the window, and gave me this nasty look. "May I speak to you, officer?" sez I. "What's your problem sir?" sez he. "Well," sez I, "I've travelled 6,000 miles to sing for these people and launch my new record in Los Angeles. It's not my fault the bloody club oversold the tickets. I appreciate you are doing your duty here, but in doing so, you are depriving me of this one great opportunity to sing for the people in this place. All I ask is to sing a few songs here on the corner. Nobody is drunk or troublesome, and the only people carrying weapons are your colleagues. I sing a few songs, you get your club cleared, and I've left a few songs for my people to remember." "Two songs," sez he. So off I went, sang three songs, with the people and the cops listening. When the songs were done, the boss in charge said he wanted a photo for the station. They got the camera normally used to photograph bodies at crime scenes, and we gathered for this shot - the punters, the cops, and me all happy as Larry. The next day, the PR woman at Warners called the station, got a copy of the show, and the music press and gossipy press all featured the shot and the story for the next week. I got ten times the PR I would have got had I done the whole gig in Molly Malone's. It's a bit like the GPO in 1916. Even though there were about 250 people there that night, about 1,000 have sworn they were there the night the cops pulled Luka's gig in Molly's. Great craig. Luka Bloom's Innocence is available on www.lukabloom.com and has just been released on Big Sky Records. Ten albums. That's how may collections of songs Luka Bloom has recorded. And while his new album, 'Innocence', features some fine playing by guest musicians, Luka insists on performing solo on his current tour. "My gig is very personal," he explains. "I'm used to expressing myself on my own and developing a rapport with the audience. I haven't done a Vicar Street-type gig in Dublin for about two years so I want to do this one on my own. That said, I'd love to do a gig later in the year with the lads who play on the record because I think they're great." Given the number of young singer-songwriters who've captured the public imagination in recent years, Luka Bloom can be seen as something of a prophet in his own land. "The scene is very different to what it was," he says. "I grew up in the '70s when there were people like myself, Freddie White, Sonny Condell, Leo O'Kelly, Mick Hanley and John Spillane soldierung away. The one thing that was very different in those days was that there wasn't an audience for guys who wrote songs. Every single one of us struggled to earn a crust. The only one who did well in Ireland in those days was Freddie White because he did brilliant versions of Randy Newman songs." "Credit is due to lads like the two Damiens [Rice and Dempsey], Paddy [Casey], Glen [Hansard] and Mundy - they are the first generation of Irish songwriters to emerge into an Ireland that actually wants to hear their songs," adds Luka. Writing songs since the early '70s, when he was known as Barry Moore, Luka moved to the States where he reinvented himself as a writer and performer. While he's excited by the current vogue, he doesn't see himself as part of the new wave of Irish songwriter. The meditative qualities of his new songs suggest, rather, a mature artist at work. "I'm going to be 50 this year," reveals Luka. "And I've been writing songs since I was 14. For the most part I work alone with the guitar and it's so easy to fall into a trap of making the same record over and over. I always try and challenge myself to say something a bit different. And I always listen to different music. If I can't keep this exciting for me, how am I supposed to bring an audience along?" Bloom's songs on 'Innocence' display what might be considered a strong pagan undertow. "Maybe that has something to do with moving back down to the bog, going back to the roots, literally," he suggests. "When you live in the city you don't notice the seasons changing because of light pollution," he adds. "This might sound like a small thing, but to me the details of songs are what life's all about." 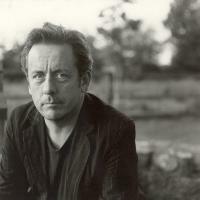 Luka Bloom plays Dublin's Vicar Street tonight. His name is Luka - Luka Bloom - the doe-eyed Irish troubadour, with a fine line in heartfelt acoustic simplicity, back in Ulster tonight. Recent times have seen the brother of Irish folk legend, Christy Moore, finally enjoy a series of celebratory Bloomsdays in his own right. For the man born Kevin Barry Moore has accepted that his strength lies in creating lyrically astute, musically-sparse, folk inflected songs - much like his famous sibling. Back in 1987, it was a different story, though. Tired by constant comparisons to Christy, he left Ireland to carve out a new career and identity in the USA, as Luka Bloom. Soon, his blistering live shows in Washington and New York earned him a coveted contract with US label, Reprise, recording a trio of albums - Riverside, The Acoustic Motorbike and Turf - which made him a name in his own right. But corporate changes brought a contractless Bloom home to Ireland. By the late Nineties, he seemed consigned to being one of those nearly men of the music world. However, recent times have witnessed Bloom reconciling himself to his past, and his primary strength, as an Irish 'folkie', with a rock edge. Going the independent route, he released an acclaimed album of quirky cover versions - such as Abba, Bob Marley and Radiohead songs - done acoustic folk style - on 2000's Keeper Of The Flame. But it was the surprise success of last year's short, but very sweet, Before Sleep Comes album which reawakened people's interest in Bloom's neglected talent, to a significant degree. His new album, Innocence, hears Bloom reflecting on his age (he's 50 this year) and touching memories of a bygone age of "incense" and "benediction". Recurring problems with tendonitis in his right hand and throat problems in 2004 forced Bloom to strum his guitar softly and sing softly. That 'less is more' approach has paid off handsomely, with a finely-crafted series of songs, which are all the more powerful for their stripped down sound. Tracks, such as Gypsy Music, and No Matter Where You Go, There You Are, may be burdened with 'we're all brothers under the one skin' folk world clichés. But the lions' share of Innocence's songs bask in a beautifully evocative, late night, new day dawning, romantic glow. But it's Bloom's intimate, confidential vocal tones and the arrow-hearted melodies of songs such as June, Peace On Earth and Thank You For Bringing Me Here which shine the brightest on this little gem of an album. He may never match the revered critical and commercial appeal of big brother, Christy. But Innocence deserves to be heard by just as many people. It's Bloom-in' marvellous. 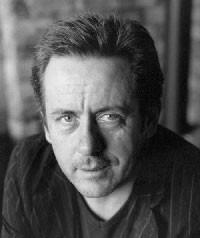 Luka Bloom is in concert at the Waterfront Hall Studio, Belfast, tonight. Tickets, �15, are available from Ticketmaster outlets, and at the venue this evening. Singer-songwriter Luka Bloom, a native Newbridge in Co Kildare, began honing his craft in 1969 on tour with his older brother, Christy Moore. Luka, who turns 50 this year, continues to bring his songs to clubs, theatres, festivals, bars, arenas and dives all over the world. LB: Gerry Adams. He's always himself. Who has got it wrong? LB: Most politicos, who rely on people who insist on moulding them into something other than their true selves. LB: As little as possible; never calculated it. LB: Dr Bronner's peppermint soap. LB: My new Docs. I don't understand seasonal clothes, except the difference between togs and wellies. With a few minutes to change before a party, what do you wear? LB: In truth, I don't change. I go with whatever I have on. What was your last cultural outing? LB: A Tommy Tiernan comedy gig. LB: Mark at Kazumi in Dublin. LB: The Red House in Newbridge - before it burnt down! LB: I run on the Curragh. What style would you most like to see coming back? LB: Bellbottomed cords are back already, so I'm sorted. Kildare's favourite son and godfather of the singer-songwriter scene, Luka Bloom, talks to Jackie Hayden about his most intimate album to date, Innocence, gigging with The Frames in Australia and hanging backstage with Gabriel Byrne. The new album Innocence from Luka Bloom is regarded by many as his most intimate to date, with a more cohesive and organic feel on offer throughout. Bloom himself, shortly off to launch the album in Europe as well as embarking on a lengthy tour of Ireland, explains: "I made a decision not to go into a studio, and I'd just built this house in Kildare. So the producer, Brian Masterson, came down with some old mikes. With the exception of 'City Of Chicago', which I wrote twenty years ago, all the songs were virtually written and recorded in the same living room, songs like 'Venus' or 'First Light Of Spring' or 'Primavera'." Bloom was off the musical radar for part of last year due to an operation on his vocal chords. Might this also have had an impact on the end product? "Quite possibly," he admits, adding, "I was so excited to be given a clean bill of health. But to ensure I didn't repeat the damage I'd done to my voice I took some voice coaching, which I'd always shied away from, as I was probably afraid it'd turn me into a John McCormack-style singer. But I needn't have worried. That too might account for the intimacy you talked about." His approach to gigging has also changed. "I went to the USA in 1987 with two guitars and a fairly confrontational style of performance, determined to become a one-man U2. That worked well for me until my voice went and I'd got a bit bored with what I was doing anyway. So with the voice problem it was probably a case of my body telling me to make the kind of changes that I probably knew deep down had to be made." Bloom is arguably more popular overseas than at home, attracting sizeable audiences and record sales in places as far apart as Belgium and Australia, and it was on one recent jaunt down-under that he ended up on stage with The Frames. "Well, I'm a big fan of The Frames and I went to their gig at The Metro in Sydney, and Glen was announcing that the next song was the Elvis Presley hit 'I Can't Help Falling In Love With You'. Then he said 'and we've got a guy here who can sing it' and he invited me on stage with him. It was great to do it spontaneously like that," he enthuses. Bloom's level of popularity, especially in Australia, inevitably results in tales of one celeb or other blagging their way into his gigs. The latest was none other than Miller's Crossing and Usual Suspects star (and one-time Bracken lead!) Gabriel Byrne. "Gabriel would never have to blag his way into one of my gigs," laughs Luka. "He and I are really good friends. He was born in Dublin but I'm gradually helping him rediscover his Newbridge connections, so he's on his way to becoming a born-again Kildareman! In fact, real celebrities rarely have to blag their way into gigs anyway. I usually find that it's people who claim to be third cousins of Christy Moore who want to get on the guest list. You wouldn't believe the number of cousins Christy has in Australia!" Bloom is very much aware of the new talent on the Irish singer-songwriter scene, so I wonder how does he balance his admiration for them musically with the fact that ultimately he's competing with them for gigs and record sales? "There's more than enough room for us all out there," he argues. "I was at a movie recently and the Declan O'Rourke album was played in the cinema before the film started. That itself was an amazing leap forward even from my early days. There was no way back then that an album of mine or Christy's or Mick Hanly's would have been played like that in a cinema. So I take my hat off to these guys." As a man who spends a considerable part of his life as a nomad traversing the globe, does Luka have a favourite place in the whole world? "Ballyvaughan," he tells me. "I only discovered Ballyvaughan a few years ago and for me it's the most magical place I've ever been to. When so much of your life is spent planning how to get to the airport, it's great to have somewhere so beautiful you can get to without having to get on a plane." Luka Bloom's Innocence album gets a live airing at the Playhouse, Derry (May 28); An Grianan, Letterkenny (29); and Stage Two, Waterford (31). Luka Bloom will play the Róisín Dúbh on Sunday June 5 as part of The Galway Sessions 2005. It's fitting he should play a trad festival because when he started off in the 1970s it was as a folk singer called Barry Moore. Back then he often played support to his brother Christy's band Planxty. When Planxty reformed for some gigs last year, Luka was again providing the support. Did he get a sense of deja vu doing those gigs? "The deja vu was when I saw them in Vicar Street," Luka tells me over the phone from his house in Kildare. "It was a shock seeing them together after all these years. As for playing support I just presented myself and did my gig. I'm allergic to nostalgia." That's not suprising. Luka's never been afraid to change or move forward. After his time as a folk singer, he led a new wave band called Red Square, then in the late 1980s, he moved to the USA, changed his name to Luka Bloom, and got what he tells me were "a few positive kicks up the arse" in New York. He had finally found his identity and a highly distinctive songwriting approach. Watching Luka on stage supporting Planxty in Galway last December, it was hard not to conclude that he's never been better. Indeed Between The Mountains And The Moon (2001), live album Amsterdam (2003), Before Sleep Comes (2004), and this year's Innocence, represent his strongest ever run of albums, and some of the best by any Irish singer-songwriter in recent times. "I think I have been a late developer," Luka says modestly, though he admits his most recent work is among his strongest. "Something has shaken in me in the last two years. I decided to simplify the guitar and focus on the lyrics and get across what it is that really motivates me and moves me. I'm going to attribute some of that to the house I live in now in Co Kildare on the outskirts of the Bog of Allen." "I would regard that as a perfect analysis of what drives me and motivates me," Luka replies. "Writing songs for me is about making the ordinary extraordinary. People live such fast, materialistic lives that we lose touch with the essential magic of the ordinary." True to his "I'm allergic to nostalgia" stance the album is in no way sentimental or self-satisfied. There is a boldness to it, a determination to make the listener look at things from a different point of view - whether it is to simply appreciate the moment or the increasingly changing face of Irish society. "I don't believe music can change the world in a global sense," says Luka, "but I absolutely believe it can transform an individual life and can articulate our experiences, sorrows, joys and I think that is the challenge of this particular songwriter." Luka Bloom plays the Róisín Dúbh on Sunday June 5. Tickets are available from the Róisín Dúbh, Mulligans, and Redlight Records. Ennis has been confirmed as a stop on the upcoming Luka Bloom tour which sees him travel to a dozen locations throughout the country in May and June. It's appropriate that Luka has chosen a Clare date, considering his appreciation for the county and the inspirational role it has had on his music and writing. The tour follows the release of his latest album, Innocence, and he says his performances will see him maintain his commitment to the live performance. "Every gig is precious", he tells The Clare Champion. "Whether the Spa in Lisdoonvarna, Glór in Ennis, or the Melbourne Concert Hall, the privilege is the same, as is the commitment to the gig." Having trod the boards of stages all over the globe, 36 years of craft honing has given Luka Bloom from Newbridge a place on the music map. In 1987, Barry Moore crossed the Atlantic, flew to America and Luka Bloom came back. Singing his songs around the US, gigging with The Pogues, the Violent Femmes, the Dixie Chicks, Hothouse Flowers, the Cowboy Junkies, he later signed with Warner Music in Los Angeles, and made Riverside, The Acoustic Motorbike, and Turf. Five years back, Luka recorded Keeper of the Flame, an album of eclectic covers artists which have informed his path and 2001 brought another heavy schedule when he released The Barry Moore Years, an album of early songs written before 1987. In the same year Luka made Between the Mountain and the Moon, an album of new original songs and this was followed with Amsterdam - a live performance from a great night in the Carre Theatre in the heart of Holland. In 2004 Before Sleep Comes was recorded, nine soft songs ideal for insomniacs, and it's obvious the relentless dedication to recording still exists. Innocence is the tenth album, a milestone in his development. Autumnal shades pervade the recording and all the road miles, pedal rotations and late night concerts have wrought a burnished tint to the man who�s provided classics as diverse as the languid Sunny Sailor Boy, the lonesome and harrowing The City Of Chicago and the defiant You. And now, ten albums on, Luka Bloom�s musical journey has brought him to a place where songs seep from every pore, and melodies celebrate the ordinariness of life. "Some musicians grow wizened by the road but I reckon I've thrived on it�, he says. Luka's travels have stretched his tendons, his muscles and his imagination in ways only few could have anticipated. "Innocence captures that journey," he adds, "not so much with surgical precision, as with an ear and appreciation for life's hidden details." Embedded within all the tracks is the spirit of a musician who�s long let go of the cocky defiance of youth, who bears the scars and celebrations of daily life with a comfort born of the same regrets, delights and minor triumphs that are shared by all. No Matter Where You Go, There You Are sums it up sweetly, on the back of Bloom's trademark uncompromising guitar lines: "No matter where you go, there are you. So don�t let go of what you know to be true". Luka Bloom plays Glór on Saturday, June 4. "... what comes out is what's in my head and in my heart and in my soul and I go for it every opportunity." 'Innocence' is the name of the new album from Luka Bloom. "An unusual title", I thought at first, but when I listened to it I heard something tender, something fresh and something almost innocent. I spoke to Luka prior to his gig in the Forum. Jackie: Unusual title Luka? What's behind it? Luka Bloom: Unusual title? - yeah it's unusual for a fellah who's just turned 50, (ha, ha) but the reason for it is very simple. I regard the whole business of 'innocence' in the context of writing songs to be so important. It's so easy to become cynical. Go into automatic pilot and keep writing songs and doing gigs but the reality is I only want to sing songs I feel a great hunger and passion for and the only way I can do that is to retain the wonder of the world and that's the innocence I'm talking about. J: Almost childlike innocence then? Luka: The innocence we're born with but is beaten out of us by the time we leave secondary school. There's also an adult innocence and a perfect example of this is a great story that was on the radio last week about an old man who is a legend up around Monahgan because he is still going to discos! He goes to discos and he loves it, he says: 'other people go for walks - I go to the disco and I dance and all the young people come up to me and sometimes buy me a drink and sometimes give me a kiss. We have the craic!' That's fantastic, he doesn't care if he makes a fool of himself - he wants to celebrate his life in that way and that's the innocence I'm talking about. J: The album has got some great reviews, you must be happy with that. Luka: Well pleased. I wrote the songs in my living room and recorded it in my living room and that's a first for me and I think some of the homeliness comes through. J: Apart from the lyrics what impressed me was the the guitar accompaniment which is quite remarkable - how do you get such a sweet and warm sound? Luka: Well I have my own kind of tuning and it works for the kind of music I want to play and the songs I want to write. It's what I've been used to for so many years and now it's part and parcel of what I want to do. J: Yeah, there's a real sense of freedom on the fretboard that carries you along. Luka: Well, what comes out is what's in my head and in my heart and in my soul and I go for it every opportunity. J: Of the new songs I particularly liked 'Primavera', 'Thank You For Bringing Me Here' and 'June' but also I note an old song, 'The City Of Chicago' is in there. How come? Luka: I wrote that song in 1984 and it's the only old song on the album. I've been meaning to record it for years but it just didn't sit right with other albums I'd done. Last year I started singing it again and found a whole new way of doing it, much more intimate and much more solitary. That song is actually on the history curriculum in school now, it's just a simple song that has worked its way into the Irish psyche. Today FM's Tom Dunne remarked about it that he can't imagine Ireland without it. I'm very proud of it. J: And well you should be! Some time ago my son asked me if I knew the words of that same song for some pals who were going to America and wanted to play it there. Luka: Were they young lads? Luka: I think that's brilliant to see fellahs of that age interested in these songs. Luka: Listen, there's a generation of Irish songwriters now and they are the first generation of Irish songwriters to be loved in their own country: Paddy Casey, Mundy, Damien Rice, Declan O'Rourke, etc, and it's great that they're all doing well in Ireland. Luka: Yeah. In the 70s they were many of us who struggled to get gigs, unless you were singing Bob Dylan or Randy Newman songs, and if fairness to Waterford all through those dark and dreary days I was always guaranteed a good gig in Waterford. J: I'm delighted to hear that so you're looking forward to your next one? Luka: Absolutely. I have a long history in Waterford. I've done a lot of gigs there down the years, played Mullanes, Geoffs, T & H Doolans and all kinds of places. It's a great oul' town for the music, always a good feeling about the gig. J: We're looking forward to having ya down here and by the way a very happy birthday to you. Luka: Oh right, yeah thanks. J: And hey don't worry about that turning 50 thing. I did it last year and my daughter informed me that 50 is not that old - if you're a cheese! Luka: Ha! ha! Thanks Jackie, I'll keep that in mind. Take care and good luck. See ya soon. I have been completely grooving on the new Luka Bloom CD, Innocence. I'd love to tell you more, but Bloom's management has threatened me with castration if I talk too much about it before the artist formerly known as Barry Moore inks a U.S. distribution deal. While I can't say much about the whisperings I�ve gotten from his camp, Bloom was quite chatty about the disc that Hot Press claims is his most intimate yet (obviously, they never heard Turf, but that�s another story). "I made a decision not to go into a studio, and I'd just built this house in Kildare," explains Bloom to Hot Press. "So the producer, Brian Masterson, came down with some old mikes. With the exception of 'City of Chicago', which I wrote 20 years ago, all the songs were virtually written and recorded in the same living room, songs like 'Venus' or 'First Light of Spring' or 'Primavera'." I will say that Bloom is none the worse for wear for the operation last years on his vocal chords. "I was so excited to be given a clean bill of health," he says. "But to ensure I didn't repeat the damage I'd done to my voice I took some voice coaching, which I'd always shied away from, as I was probably afraid it'd turn me into a John McCormack-style singer. But I needn't have worried. That too might account for the intimacy you talked about." Bloom has been touring his head off ever since Innocence was released, and he even shared the stage with old pal Glen Hansard. "I'm a big fan of the Frames," he says. "I went to their gig at the Metro in Sydney, and Glen was announcing that the next song was the Elvis Presley hit 'I Can't Help Falling In Love With You'. Then he said, 'And we've got a guy here who can sing it,' and he invited me on stage with him. It was great to do it spontaneously like that." Let's pray that the distribution deal gets inked soon, as no self respecting fan of Irish music in general and Luka Bloom in particular should be without Innocence. Stay tuned for more information on Bloom. My last word on the topic - Innocence will be worth the wait. The missus took one listen to this and has made off with the CD for her own use. If Luka's reading this, send more CDs! Luka Bloom's latest album 'Innocence' is in the shops and the Kildare-born troubadour plays Glór this Saturday, June 4. Luka Bloom's new album sparkles like a thousand diamonds in golden sunbeams. 'Innocence', playing softly in the CD player, requires you to relax as it envelops you, like the warm shadows of an open fire, in its unique ambience. Bloom's songs have the beautiful ability to instil in the listener's mind a wealth of imaginative thoughts. Be it dining alfresco underneath the cover of a star-studded sky, or maybe kayaking around a coral-fringed lagoon...once you close those eyes, Luka's album will transport you anywhere you wish. The newly released 'Innocence' is his tenth album, so what is it exactly that keeps this entertainer musically inspired? "Every piece of absolute crap inspires me!" he laughs. "People go through things in their lives and they have all these stories to tell. So I listen and I then try to transform ordinary things into extraordinary things. That's my mission." Most singer-songwriters have a song that is special to them; a song they created with a passion that is revived each and every time they listen to the notes recorded. Does Luka have a personal favourite on the album list? "No, I don't have a favourite," he responds, with a serious tone suddenly underpinning his every word, "I love them all. I just wouldn�t put a song on the album if I didn't love it." With regards to non-musical influences that inspire his work, Luka's approach is interesting, if not unique. "I like athletes..." he tells me, "particularly their resilience. I find that very important, you know, the way people struggle to be the best they can be. People like that really inspire me." When it comes to songwriting and performing, one can only wonder if Luka secretly harbours a preference. "Writing is very solitary and very lonely, which in one sense can be a great joy, but when it comes to performing, I love the celebration of having written a song so really, there�s no black and white answer to that question." Casting aside the addictive instantaneous surge of adrenaline of live performance, one could throw a random guess at what really motivates the character that is Luka Bloom. What is it that keeps him journeying through the hard times? The money perhaps? Or maybe the music and the fun? "Well it's definitely not the money," he informs me, before quickly following it up with one of those knowing laughs. "To be honest, music is the only job I've ever had. I've been doing it since I was 16. So really, it�s the only thing I know how to do." With the 'You're A Star' series having produced yet another disappointing season, audiences tuned in with escalating hesitation each time it appeared on television. Given that Luka is a self-made artist who climbed the music-ladder the old-fashioned hard way, it's intriguing to know what he makes of Ireland�s latest breed of 'reality performers'. "I am completely uninterested in those shows. I saw Donna and Joe at the beginning of 'You're A Star' and then I saw them on the Eurovision, and I have to say they were 20 times better at the beginning than they are now. They were more themselves at the beginning, but now they�re just classic blow-up copies. 'You're A Star' is not musical and its not important to me." So in which direction is the Irish music industry headed by relying on such shows? "If a person wants to break into music, they should pursue it their own way and not go the route of 'You're a Star'. It will get you nowhere. What's Chris Doran doing now? He's opening supermarkets, but musically what�s he doing? You're A Star is a comedy reality. People should throw out their television and go and enjoy real music or even read a book. Anything is better than that show." Since he released his first album, Luka's CV has gathered a wealth of highlights. Has he changed much since album number one? "I hope I'm a better performer and a better singer, but the audience will have to be the judge of that." His gigs are his number one priority at the moment, but what about non-musical goals? Bloom erupts into laughter as he contemplates his response. "Oh God, I'd love to have a number one in Ireland, but I'd probably have to live until I'm 120 years of age for that." "I'm a closet GAA fan," he admits, somewhat sheepishly. "So I'd like to see Kildare get out of Leinster for once and maybe, just maybe, win an All-Ireland. But that�s just one of those dreams that I usually keep to myself." Luka Bloom plays Glór on June 4. 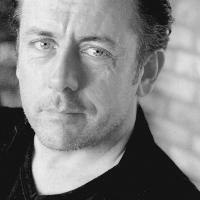 Newbridge born singer-songwriter Luka Bloom has been making music for over 30 years now. His new album 'Innocence' is the tenth of his career. Benjamin Coombs caught up with him prior to his show in Galway. - Tell us about the new album. It's the first time I've recorded at home in the same room that I wrote the songs, and it's a special feeling. I really love the album and feel very close to it. - Are you content in your work? I'm a very lucky guy. I've got a great job; I write songs and I sing them. I've never had to commute and I've never been sacked. I have a blessed life. It's always a privilege to sing for people whether it's in the Sydney Opera House or Campbell�s Tavern. - What's a Luka Bloom performance all about? When people come to my show they're not coming for the special effects or the light show, they're coming for a bit of humanity. I never set out to be an intellectual, thought-provoking songwriter; I've always set out to move people. - Do you pick up new sounds and influences when you're travelling? I'm a real music fan. If I spend time somewhere new I'm always checking out the music whether it�s gypsy music or North African music. As a solo artist I want to be inspired by other people's work. - Is it hard to keep your feet on the ground when you're successful and in the public eye? It's easy to keep your feet on the ground in Ireland, because losing the run of yourself is not something that happens easily here (laughs). The people don�t go in for looking up to you which is one of the things I like about Ireland. - Tell us about the craft of song writing. I try to avoid rules and patterns. It's very easy to fall into the trap of making the same album over and over; you find a way of recording and writing and you just keep repeating it. So the only rule I do have is that there are long periods when I deliberately don't write any songs. It's very important to have time when I'm just listening, actually living life and paying attention, and when I go back to it its completely terrifying. I'm wondering; have I changed? Have I anything interesting to say? - What else do you do to keep it fresh? I change guitars, and then my song writing changes. It�s something to do with the impact of skin on wood and the different way the strings are strung. It�s fascinating. I used to do all my gigs on these black and white guitars, but I've put them in a box and left them for over a year. Now I am only playing a very cheap Spanish guitar which I bought in Australia. I love it so much, and I gig with it and write every song on it. - Do you enjoy storytelling in your songs? Funnily enough the song writing process to me is more about painting pictures; songs are almost visual for me. Every now and then I write one that has a clearly defined story. Sometimes my songs are a little bit dream like and vague, and I like that. - Do you experiment with all the new music technology? No I'm not interested. I've actually simplified even more and gone back to basics - I'm only interested in technology as a means of enhancing my sound. I want the guitar to sound as brilliant as it can. - Do you see music as a powerful force for change? I don't see music as having the power to change the way societies behave - I believe in the power of music to transform individual's lives. My own life has been transformed by the songs and singers I've grown up with, and they've guided me through difficult times. So if one of my songs can soothe a troubled person's heart, even for an hour, then I feel like a complete success. - What music blows you away? - Does it ever feel scary to step out on stage in front of a big crowd? I used to be constantly nervous about performing but it never made me play any better, so I decided to try and believe that it�s ok to be there. I decided to enjoy it and celebrate it. - When you first write a song do you play it for anyone in particular to test it out? I only play songs to people I know will love them (laughs uproariously). You only know if a song is good once you've performed it. - What's your advice to young musicians reading this? 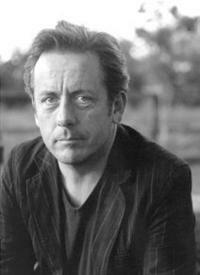 Luka Bloom plays the Róisín Dubh on Wednesday 22 June.